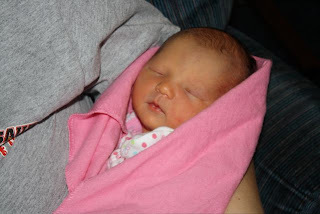 Welcome to the world Addison Grace!! 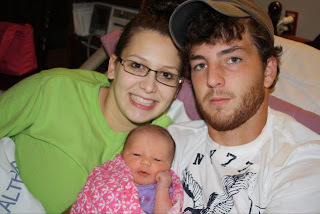 Brett and Meagan welcomed their baby girl Addison Grace into the world on September 17th, 2009. Weighing in at 6 lbs. 5 oz. and 19 1/2 inches long. Both Mommy and baby are doing great. Denise and family send out a big Thank you for all of your prayers getting her here. 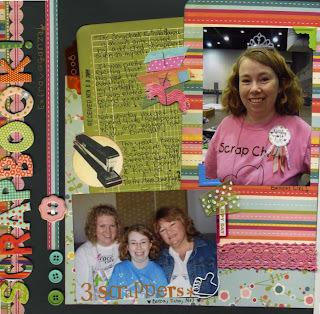 We are less than 2 months away from our 9th annual scrapbook extravaganza. Many of you already have your tickets purchased. Thank You! September 30th is your last chance to put your ticket on a payment plan. 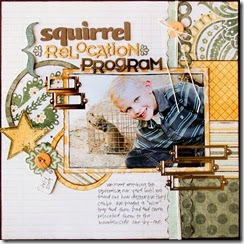 Go online at www.scrapus.com and register...don't forget all the awesome side classes!!!! Deadline to choose your T-Shirt size has changed to September 30th. We will, of course, order everyone a shirt however you will not be guaranteed your size after September 30th. It will be on a first come basis. On Friday evening when the shirts are handed out, those that purchased tickets after September 30th will need to wait until everyone has a shirt then we will begin in ticket order calling the names of those that did not get a shirt. You will get your choice of what shirts we have available at that time. Hopefully we won't have this problem because I know you are going to go straight to the website and register. We have twelve awesome classes lined up for you on Friday. Scroll down below to find the class you are most interested in. A couple of the classes are not quite finished yet so there are no pictures. I will post the photo's as soon as they are available. This year we are offering a payment plan if you sign up by SEPTEMBER 30. Your card must be ran the day you sign up and paid in full by October 31st. For Example: If you purchase the Grungeboard for $35 and the Christmas Canvas for $30 you will need to put down at least $32 the remaining balance will be deducted on October 31st. Hopefully this will help! We are limited on seating. Deadline for class sign up is October 5th. Here is an example of the book you will be making... just one page for you to sneak a peek. 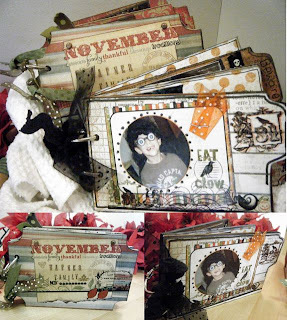 vintage, cool bracket shaped mini album to fill with your own memoirs. don't want to miss out on! Items to bring with you to this class: scissors, glue dots, really strong liquid adhesive that will dry clear. 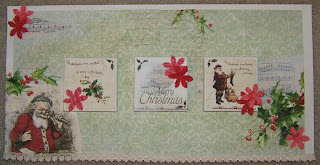 This class will introduce you to the wonderful world of Tattered Angels product. 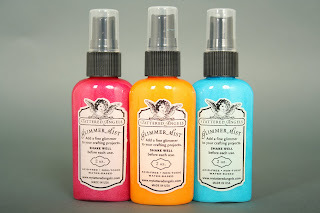 You will learn how to mist your pages with their trademark Glimmer Mist. Using the mist will give you the option to create your own background papers and it has sparkle! All the dozens of colors have one thing in common: they have mica right in the mix and it gives a spectacular shine! 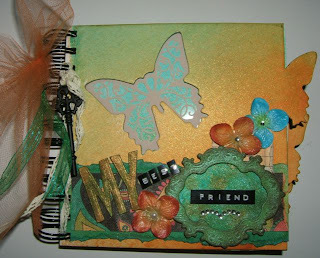 You will spray your way to a beautiful finished album complete with butterflies in cardboard, canvas and Glimmer Glass. You will have the option to personalize this 6X6 mini album for your friend, your mom, or just for you. Be ready to get creative and experiment to make your own, unique album. Items to bring with you to this class: Scissors, adhesives, paper piercer, paper trimmer. Wear your apron! I will be having a contest for the cutest apron! 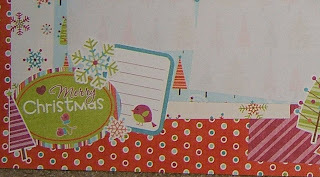 In this class you will complete a 12" X 24" Christmas canvas. This will be a home décor item to display proudly during the holidays for all to see. We will be using the new Bo Bunny line: St. Nick, some antique sheet music, flowers, and lots of paint. We will glue, cut, paint, embellish, and get our hands dirty for this class. Come ready to create and have fun. *Great gift idea!! Make one for yourself and give one as a gift. 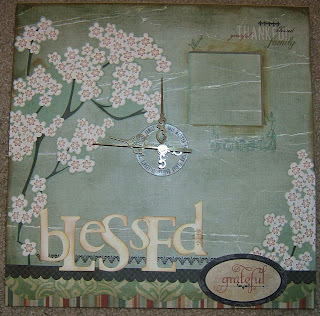 You will make a one of a kind clock in this class using the brand new Amber Road collection from Pink Paislee. Will you give it as a Christmas gift or want to keep it for yourself? You'll have to decide that one, but I'm keeping mine! You will learn how to turn an ordinary wooden clock into a beautiful and functional piece using the newest papers and rubons by Pink Paislee. The colors will be muted greens and deep browns, just beautiful together! Items needed to bring with you to the class: SMALL pair scissors, paper trimmer, heat gun if you have one and want to bring it (for speeding up the drying times of the layers of paint and Gel Medium we will be using to attach our papers). In this class, using the Upsy Daisy-Walk in the Park papers, you will create a fun piece of hanging art to display a few of your favorite photos. Please bring your favorite decorative edge scissors along with your basic scrappin materials (adhesive, scissors, pop dots...)! 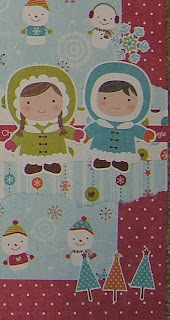 Get your kiddos or your hubby excited about Christmas with this 24 days till Christmas Goody Box. Each box slides out for you to put special goodies in. Coupons for fun things to do, candy or trinkets. Be creative you decide. Each day your loved ones will be excited to see what is in the box or just use it as a decoration. All supplies are included in your class kit. Items needed: Paper Trimmer, Black Pen, strong adhesive, scissors, sanding block if you have one. 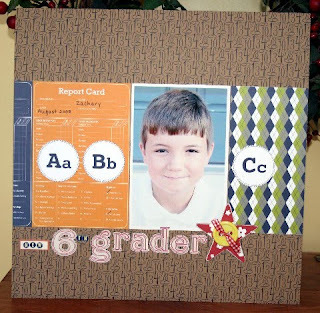 Join us for a class to make a super funky 8X8 'Oh Boy' chipboard minibook, featuring the new Bella Blvd Super Stud line. The colors are incredible,and the featured robots rock! We will be using fun techniques (paint, stickles, paper rolling, inking) to showcase photos of your little dude! You don't want to miss this class! 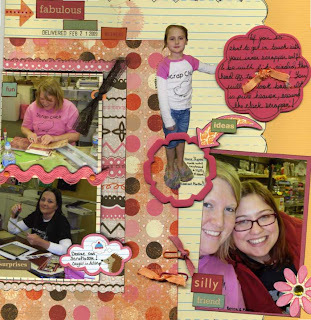 Join us for a class to make this fabulous 8X8 'Girls Just want to have fun' chipboard minibook! The class will be using the brand new Bella Blvd Flirty line, which features vibrant colors, and super sassy phrases to describe the girls in your life. Bring your photos (from one event or from different times) to create your super cute minibook! 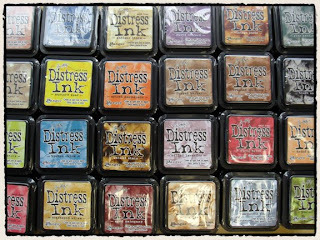 We will be using paint, Stickles, paper punching, and paper tearing. You won't want to miss this one! 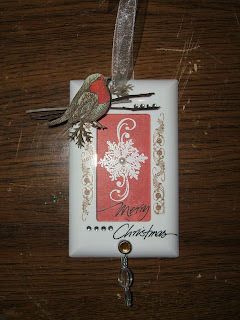 During this class you will create 4 Christmas Ornaments using the newest Christmas lines and embellishments. If you want your ornament to have a photo please bring wallet size photos or photos you don't mind trimming. The photo you see below is only a sample. You will be offered a variety to choose from. 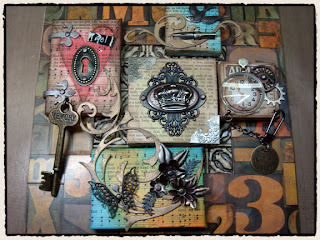 Nikki Sivils owner of Nikki Sivils Scrapbooker made her first debut at market this summer. During this class you will create one single page layout using her "U R My Favorite" line. Be the first to sign up if you would like the opportunity to meet Nikki in person and get an autograph. There will be limited seating at this class. If you are unable to make the class you can still receive the kit. Nikki will be around after her class for awhile on Friday should you need assistance. BE SURE TO SIGN UP QUICK AS SEATS WILL FILL UP FAST! BE READY TO CREATE AND LEARN NEW TECHNIQUES TO MAKE ONE OF A KIND PROJECTS. Have a good weekend! 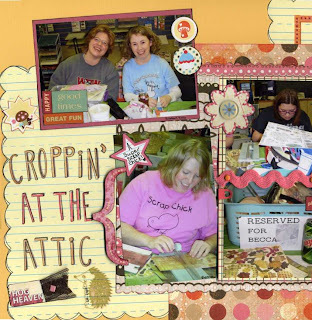 Happy Scrappin' from The Attic!! My Mind's Eye back at the Extravaganza!!! Just wanted to give a bit of info on My Mind's Eye for you tonight. They haven't been at the Extravaganza in a while, but this year- THEY ARE BACK!!! Their new lines are so, so good!! If you click HERE the link will take you directly to their blog. Here are a couple of pages from their blog. Lovin' the new stuff!!! This is the Ooh La La for her and Ooh La La for him. Have you all built your boats yet? I think we need to soon!! We had so much rain here that our neighbor's pond overflow came through our yard, and brought his fish with it! We literally had small perch floating across our driveway! I could not believe it! My son picked them up and put them in our bird bath to "save their lives"! He was so proud of himself!! This weather makes me want to stay in, be lazy, and scrapbook! I made this tonight with the new Amber Road from Pink Paislee. I think this is one of my most favorite lines I've seen so far. Love the colors...so rich and perfect for fall. 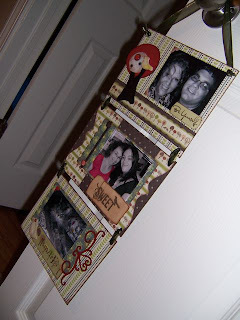 I used the punch outs and the Canvas Tag Patch on this page. You get three of those tags in a package and they are all gorgeous. This photo shows the detail of the paper pleating I've done. It is easy, just fold and staple, and repeat. You have to staple the ends together (2-3 pleated pieces) to get the 12X12 length. Easy to do and adds a bit of interest to the pages. Tonight we're talking paper, Crate Paper. Click HERE to go to their website gallery. 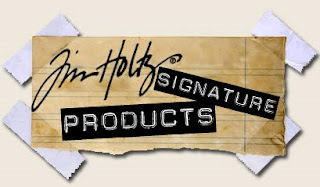 I couldn't find any good videos for them, so just go check out their website and all their new lines they have. 1 Month and 24 days until EXTRAVAGANZA!!!!!!!!!!!!!! Hope all is well with all of you out there tonight! Happy Scrappin' from The Attic!! ARE YOU EXCITED? IT IS COMING.... SOON!! WE ARE ALMOST THERE... 9TH ANNUAL SCRAPBOOK EXTRAVAGANZA!!!!!!!!! IF YOU HAVEN'T GOT A TICKET YET YOU BETTER RUN....DON'T WALK TO THE ATTIC FOR YOURS BEFORE THEY ARE ALL GONE AND YOU MISS THE BEST EVENT ARKANSAS HAS TO OFFER!!!!!! Girls, two months from tomorrow we will be standing in line waiting to have one of the biggest scrappy days of the year! I can't believe how fast time is flying by! Also, there are ONLY 97 shopping days left until CHRISTMAS! !It will be here before you know it! Speaking of Christmas and gift ideas... we are going to have several extra classes you can take on Friday the 13th... (a lucky day for us!) The pictures and pricing for these classes will be coming to your inbox soon, so keep watching for new email from The Attic!! These classes will be just what you need to help you along the way in your shopping. I think you will be very happy with what we have planned this year! Along with all the good stuff on Friday going on, Saturday will be the cherry on top! I've been giving you information on some of the new lines coming to The Attic and today I'm featuring JILLIBEAN SOUP Click on the name and it will take you to their homepage, which is one of the cutest ones EVER!! Go check out their BLOG. It is just as cute as their new line! 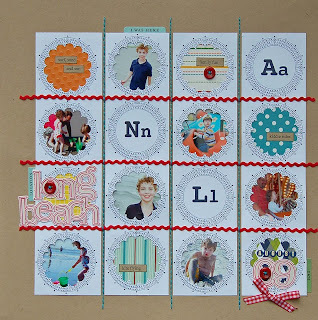 Two peas have lots of videos from CHA and this is one I've borrowed from You Tube(I'm sure the contest she talks about it WAY over as this is from July) This really shows you some papers and embellies close up from Jillibean and my favorite is Alphabet Soup- SO CUTE! Here is another video from Creating Keepsakes at CHA and Jillibean Soup. This is also pretty funny... you can tell these girls were really having a great time! I LOVE LOVE LOVE the booth here!! 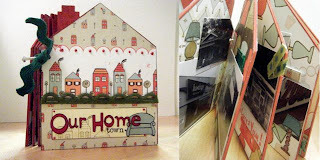 I am really considering this tin for the walls in my scrapbook hut we're finishing!! Would it not be so cute to have a wall covered in tin and make it look old and shabby? and another fantastic layout "new 6th Grader" by Jenn Emch. This is my favorite new line - Alphabet Soup. I love it!! I'm exctied about this line! It is all so cute. It will be hard to pick and choose what to use! I want it ALL!! I'm sure you do too?! I'm going to leave you with some pages from Tisha.... these are so cute! She used the backside of the Hedge Hog papers from Sass-a-Frass to complete layouts with pictures from the Hometown Crop. I will try to keep you updated a little more than I have... 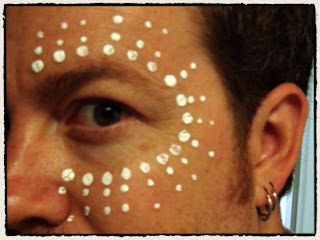 I've been really really busy and also trying to fight off all kinds of "crud", which I think I've almost got it whipped! So be watching for more great videos! Don't forget... we love comments! Let us know what your thinking. Hope you all have a great day today and Happy Scrappin' from The Attic! Today is Friday!! Thank Goodness! Yes, I'm slacking on my posting... sorry! I went back to work this week and have been laying low for the past few days! But I'm off today and bringing you information about a new company that Denise is going to have at the store soon! "Bella Blvd. 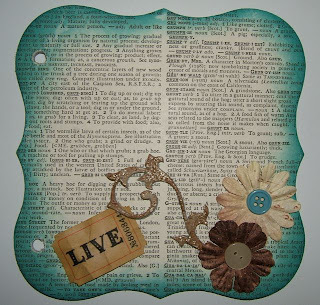 began with a love of scrapbooking, and transformed into a love for all things patterned and bright. Graphic Designer, Stephanie Hunt, founded Bella Blvd LLC, a name that derived from her Italian heritage and travel experiences, in June 2008. The studio combines creative inspiration, a love for scrapbooking and design knowledge to offer awesome paper goods for scrapbooking, paper crafting and so much more." You can find more information about Bella Blvd by CLICKING HERE. You should go check out their BLOG! Look at this!! Brand new Bella Blvd. product ready to go! Wouldn't you love to be in that room?? 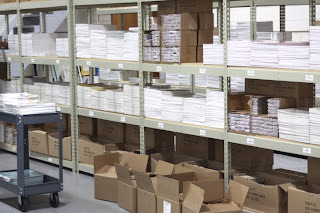 (This is a picture from their blog... taken in their warehouse). You would LOVE to have some of this, wouldn't you??? You can! It should be coming to The Scrapbook Attic very SOON!! Look at these yummy flowers! Can't wait to get these! This video is brought to you from Two Peas in a Bucket. 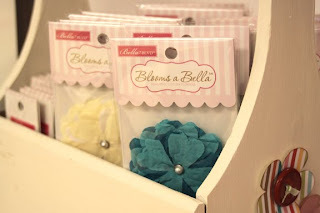 You can see some of the great new lines from Bella Blvd. Hope you enjoyed today's featured company! Have a great day and Happy Scrappin' from The Attic!! We have our first ever blog winner!! My middle son, Hunter is my winner picker tonight! He looks so happy to do this for me, hu? KIM WHITTEN YOU WIN!!!!!!!!! CONGRATULATIONS!! You can go in to The Scrapbook Attic and pick up your prize...you have until Sept. 30 to claim your winnings. Thanks to all for playing along with our first contest! I look forward to more of these, this was fun for me too! Keep watching for more details of the September contest, more videos and product features, and layouts and ideas using all the new goodies that Denise is getting in from CHA. Have a good night and Happy Scrappin' from The Attic! !